Underwater inspections are a reliable, cost effective and comprehensive way to monitor general hull condition, fouling, damage and paint deterioration. They are also an excellent way to obtain pre dry docking planning information and act as an early warning system to reduce costly repairs. Class approved CCTV surveys can also reduce the need for dry-docking which saves time and money. Aegean Diving Services is an approved services supplier to the Lloyd's register of Shipping for In-water surveys of ships and mobile offshore units and is also approved by NAVSEA for the survey and inspection of US Naval vessels. Aegean Diving Services carries all the equipment required to carry out in-depth class approved surveys, from digital clear water photographic equipment for use in poor visibility to high quality CCTV systems . Aegean Diving Services has extensive experience in the stringent inspection procedures of military vessels. Divers are in direct verbal communication with the top side supervisor and the customer. 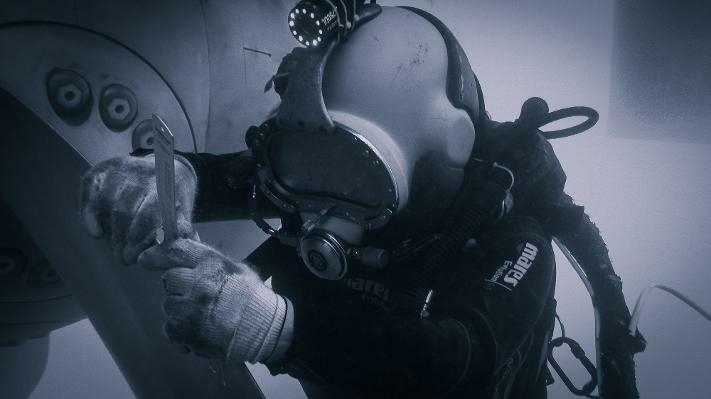 Each ADS diver is trained to report on hull conditions such as paint blistering and peeling, corrosion, fouling and structural damage as well as taking required measurements.